Google Now gives you short overview of information it believes is relevant to you right now. Going to work in the morning? Google Now knows this and lets you know there's a big traffic jam on your usual way to the office, so it offers you a re-route. It can interpret a lot of things from your search history as well. If you've been searching for, let's say, your favorite football team, Google Now will prepare a card showing you the next match the team is playing and will provide you score updates once the game begins. Google has also integrated Voice Actions. They can handle stuff like sending messages (SMS or email), initiating a voice call, asking for directions, taking a note or opening a site. Google Now can also launch apps, check and manage your calendar and look for nearby places of interest and stuff like movie openings in theaters. Google Now on the Xperia ZL gets activated with a press-and-hold of the virtual Home button. You can either type or talk to it and the app will give you one of its aforementioned info cards (if available) and read you its contents aloud (you can disable this from the app settings). If there's no card to help with the answer to your question Google Now will simply initiate a Google web search instead. We've prepared a review of all popular voice assistants and you can learn even more about Google Now there. Just follow this link. The Sony Xperia ZL phonebook looks slightly different from what we're used to in ICS and thanks to the light background it looks livelier. The bottom bar holds shortcuts to search option, add number field, and the advanced settings menu. The contacts, phone, favorites and groups tabs have been moved to the top and can be side-swiped. The contact list can be sorted by either first or last name. There are two contact search options - a dedicated search field at the bottom of the contact list, and an alphabetical scroll bar to jump to names starting with a specific letter on the right. If a contact has accounts in multiple services, you can "link" their details to keep everything in one place. Their Facebook photos and interests (part of the Facebook integration) will show as extra tabs. Quick contacts are enabled - a tap on the contact's photo brings a pop-up windows with shortcuts for calling, texting or emailing the contact. Each contact can have a variety of fields (and repeat fields of the same type). There's an Add field button and the X button lets you remove fields as needed. The fields cover anything from names (including a field to write the name down phonetically) to addresses, nicknames and notes. There is an option to redirect calls directly to voicemail. Custom ringtones are enabled too. Receiving and making calls on the Xperia ZL was trouble-free. The built-in secondary microphone is used for active noise-cancellation, so calls are loud and clear even in noisy environments. The call log is integrated in the dialer - it shows a list of recently dialed, received and missed calls in the top half of the screen and the keypad on the bottom half. Once you start typing, the call log is replaced by the smart dial list which searches for matches in both the contacts' phones and names. You can hide the keypad to make more room for the call log. Thanks to the proximity and accelerometer sensors, the Sony Xperia ZL automatically disables the touchscreen when you lift it up during a call. We ran our traditional loudspeaker test on the Sony Xperia ZL, and the results were close to excellence. 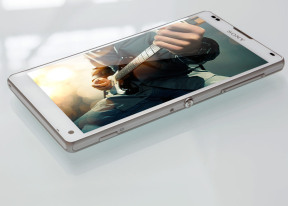 Scoring a Very Good result promises you won't miss any notification with the Xperia ZL. If you turn on the xLOUD option and turn off ClearPhase you get louder speakerphone even if of slightly inferior quality. Text messages and MMS use standard threaded layouts. Each thread is displayed as an IM chat session, with the most recent message at the bottom. You can manage individual messages (forward, copy, delete) and even lock them against deletion. Search is enabled to locate a specific message in all conversations and you can also activate delivery reports. Adding multimedia (photos, videos, sounds, etc.) will convert the message into an MMS. Moving on to email, the Gmail app supports batch operations, which allows multiple emails to be archived, labeled or deleted. The app supports multiple Gmail accounts, but there's no unified inbox for other email services. However, the generic email app can do that. It can handle multiple POP or IMAP accounts and you have access to the messages in the original folders that are created online. Google Talk handles Instant Messaging. The GTalk network is compatible with a variety of popular clients like Pidgin, Kopete, iChat and Ovi Contacts. As for text input, the Xperia ZL offers a customized on-screen full QWERTY keyboard. Typing on the portrait keyboard is fairly comfortable - the screen is big enough to house decently-sized keys that are easy to hit. Flipping the phone to landscape gives you even bigger, easier to press buttons. There's also the added feature of being able to customize the keyboard. You can choose a different skin, or even a new key layout. You can also try the so-called Gesture input if hitting those keys individually doesn't give you the desired typing speed. It's similar to Swype, and even if you've never used a Swype-like input before you'll quickly get used to it.